This week Six Flags Discovery Kingdom announced that along with the new Batman 4-D Free Spin coaster opening this year, they’re also going to be doing some retheming at the park. Batman will be the newest attraction in the new DC Universe area. The corner of the park that has seen all of the attention over the last several years is going to officially become the “DC Universe” area of the park. The section had already unofficially been going that way. Starting with Superman: Ultimate Flight in 2012, Discovery Kingdom has been steadily adding DC themed attractions to that area. 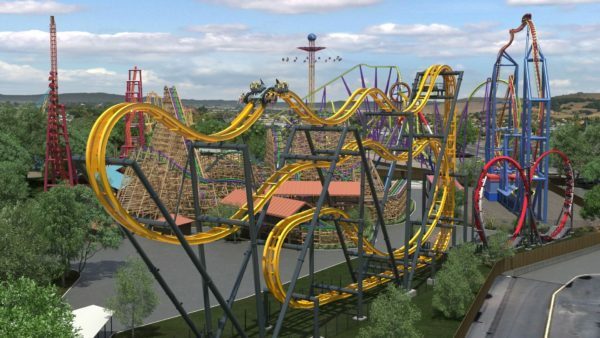 The Joker, Wonder Woman: Lasso of Truth, Harley Quinn Crazy Coaster, a re-theme of “Tsunami Soaker” to The Penguin, and now Batman have all been built next to each other over the last 7 years. So it comes as no surprise that the area is getting officially re-themed. Along with the re-theming of the area, the other roller coaster in that section of the park is also going to be refreshed. 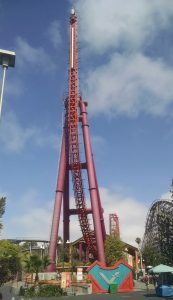 V2: Vertical Velocity is going to become “The Flash: Vertical Velocity”. A fitting name for the launch coaster. In their press release the park says the ride will feature “new thematic elements”, so it’s not just a rename. The refresh is good news for a coaster that sometimes sees a lot of downtime, and I personally think is an underrated ride in the park. DC Universe is also going to have some new food and retail locations. A new batman themed store will open to go along with the small Daily Planet shop and Joker shop. Quick Quenchers Refill Station and Big Belly Burger (which will have mobile ordering) will open to provide food and refreshments to guests in the back corner. There will also be DC character meet and greets in the new area of the park, which should be a good addition for super hero fans. No opening date for Batman or official date for “DC Universe” have been announced yet, but the park is open. More information on Six Flags Discovery Kingdom, including operating hours, can be found on their website. Make sure to follow Coaster101 on Twitter and Facebook for all the news on ride openings this Spring and Summer, and we’ll let you know as soon as we get an opening date for Batman at Discovery Kingdom!